Washington, DC (www.NewYorkInjuryNews.com) – The U.S Consumer Product Safety Commission (CPSC) http://www.cpsc.gov, in accordance with Children’s Apparel Network, Ltd., of New York, NY, announced a voluntary recall of Girls’ Hooded Sweaters with Drawstrings with drawstrings on March 24, 2010, as reported by the CPSC. The CPSC and Children’s Apparel Network, Ltd. recommend that consumers stop using the recalled items immediately. The sweatshirts were made with a drawstring through the hood, which poses a strangulation hazard to those wearing them. In February 1996, CPSC issued guidelines for the production upper garments, such as jackets and sweatshirts, in order to prevent children from getting strangled or entangled. The industry voluntarily incorporated these guidelines as standards. The recall involves approximately 9700 items. The sweaters were sold in conjunction with a three-piece set with a knit shirt and corduroy pants. The sweater had flower appliqués and embroidery, according to the CPSC report. A label in the neck contains RN# 164395. 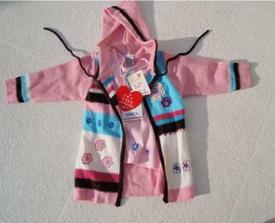 The hooded sweaters were sold from sizes 2 to 4T and 4 through 6X. The items were available at Burlington Coat Factory, Pamida and Ross Stores nationwide from June 2008 to November 2008. They retailed for approximately $15. They were manufactured in China. Consumers are told to either remove the drawstrings immediately to eliminate the strangulation hazard or to return the garment to the place of purchase for a full refund. Any additional information can be obtained by calling Children’s Apparel Network at (800) 919-1917 between 10 a.m. and 4 p.m. ET Monday through Friday.